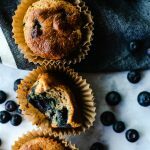 Made with Equip Prime Protein, these protein-packed blueberry muffins are gluten free, paleo, and dairy free! In a medium bowl, whisk together coconut flour, protein powder, baking powder, baking soda, and cinnamon. Add eggs, coconut oil, cashew butter, and vanilla, stirring vigorously until smooth. Add blueberries and stir until just combined. Drop batter into muffin liners, filling each about 3/4 full. Bake for 20 minutes or until cooked through.